Booked for a family getaway. The hotel is 150 ft from the Belmont Red Line station, but we never heard the trains. Very accessible to public transportation. The hotel is in a very old building but is very well maintained and clean. The staff was very friendly and accommodating. Our room was a small suite, with a sitting area and television. There were two small refrigerators, one for the mini bar (quite reasonably priced) and the other for general use. The beds were comfortable. The continental breakfast was good, as was the coffee. Overall, it's a nice, reasonably priced hotel that I would stay in again. Very nice small hotel, older area of Chicago. Clean room, very comfortable bed . Close to Wrigley field, parking lot is about a block away. We will stay there again. Place was okay. Expected more for the price payed. Breakfast was not good. Location was okay. A lot of construction outside, the location DOES NOT provide airport shuttle. It’s a quaint boutique hotel. Nothing fancy but comfortable and clean. Great location for Wrigley and Boystown. Staff wasn’t rude but they weren’t the most friendliest staff. I think I only saw one of them smile back at me. Overall good stay. Cannot say enough about how great of a hotel this is. Check in was a breeze and quick. Staff was polite and informative helping with parking and directions to a few places. The room was a standard room and it was just the right size for what we needed. Some may say it is a tad small, but really we weren't camping at the hotel so we just needed a comfy place to sleep and get readt and so on. The bed was really comfy and not too stiff like many hotel beds are these days. The sheets were clean and soft. The bathroom was chic and slightly vintage but also clean. It even included plenty of shampoo and conditioner and body wash of pretty good quality. Not that cheap crap you usually get. A big bottle of each that had enough to last a couple people a week at least. Next is the honor system mini bar and snack tray in the room. Most hotels want to rip you off for these items but not here. I can of beer is only 2.50 and snack were around 1.50 for chips, a candy bar ect. In the fridge there were about 5 different beers to choose from, some liquor, various cans of pop and water and wine.If you want a nice small comfy room in about as convenient of a location as possible this is it. The hotel is clean, well-situated, and has character. Our room overlooked the main drag—Belmont—which made for a noisy Saturday night when we were trying to sleep. If I stay here again on a weekend, I will ask for a room facing a different direction. 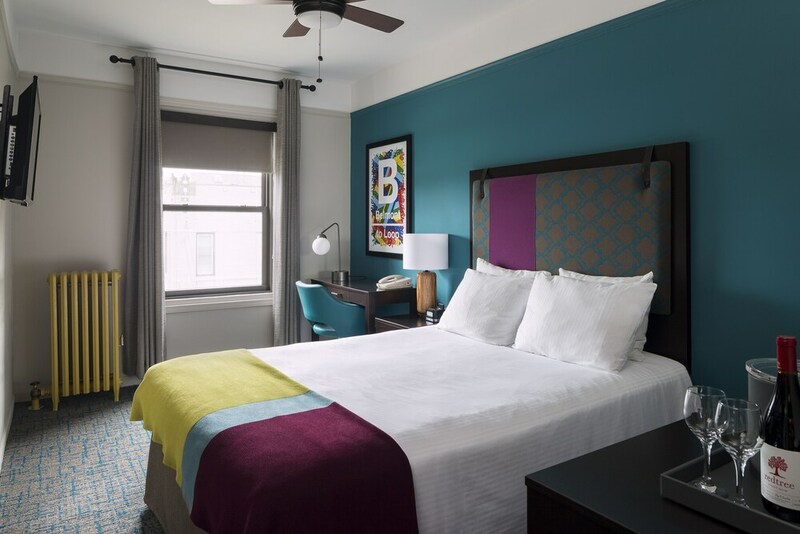 City Suites is very conveniently located for those staying on the north side of Chicago. We liked its small size. Staff attended quickly to whatever needs we had. Hotel is okay, a little over priced for what you get. The room was plenty big if traveling with children; however, the included breakfast is barely anything and was a big disappointment. The gym around the corner is sufficient and the facility is located right next to train, not loud though. Perfect for a cubs game, will definitely stay again. The fairly-but-not-too-much-updated hotel had very helpful and personable staff. It is literally a weak arm's 'stones throw' (or baseball) from the Belmont "L" station. The old-ish neighborhood is 'young,' improving, and relaxed with some very good restaurants. Wasn't sure what to expect after reading some revues. I would not have changed a thing, room was very nice and clean, staff was super nice and ready to help in any way. Was in town for Cubs games, such a nice short walk with friendly folks all along the way. The hotel staff was so helpful for our first trip to Chicago, from restaurant recommendations, walking directions, and making sure our taxi was there for our departure back to the airport. Thanks for a great experience, will surely stay with City Suites next time we come to town to see the cubbies. A great location for visit to Lakeview or Uptown. Self parking is odd - you park about a block-and-a-half away as a parking structure operated as Hertz car rental. A true city stay in an older hotel that is well kept. To retrieve your car, you have to take a garage key fob from the hotel, then return it. A little noisy, right off the Belmont station. Great location! Only six blocks from Wrigley. Next to the ell. Lots of restaurants within walking distance. Room was very clean. Great value for the price. Food service and mini bar were very reasonably priced. Staff was very accommodating and helpful. The place was great except the main room was a little dark once the sun set. Other than that it was perfect. The staff could not have been nicer! The hotel was very sufficient. Room was wonderfully designed and clean. The noise from the train is inescapable but that just goes with the territory. Some of the facilities are looking a little worn: e.g., carpet, molding, stairwell. Again, this would not be a reason not to visit again. We actually have stayed at the sister hotel The Willows a few times, but they were full this time. Given the choice, we would likely choose The Willows but would choose City Suites a fairly close second. Located in Lakeview, City Suites Hotel is adjacent to Vic Theatre and within a 10-minute walk of other popular attractions like Briar Street Theatre. The 45 rooms at this 3-star hotel include refrigerators and minibars and guests can enjoy free breakfast. Free continental breakfast is included with your stay and awaits you each morning from 7 AM to 10 AM. Satisfy your hunger from the comfort of your room with room service. Guests can enjoy cable TV and stay connected with free WiFi. The bathroom offers hair dryers, designer toiletries, and bathrobes. Other standard amenities include a refrigerator, a minibar, and a video-game console. Guests of City Suites Hotel enjoy access to free WiFi in public areas, coffee in a common area, and microwave in a common area. Self parking is offered for USD 25.00 per night. The front desk has multilingual staff on hand 24/7 to help with luggage storage, dry cleaning/laundry, and securing valuables. Additional amenities include express check-out, free newspapers, and a fireplace in the lobby. Dear Guest, Thank you for staying with us and took he time to review us. Happy New year!!! nice hotel next to the "el"
great location for wrigley field. hands down the best hotel for the area overall. convenient loc.. but that's it..
Additional policies and fees may apply when booking more than five (5) rooms. Group bookings are subject to a 2 week cancellation policy. For more details, please contact the property using the information on the reservation confirmation received after booking.